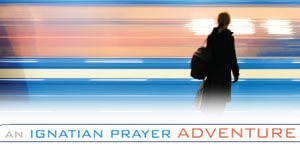 Scott Santarosa, SJ, talks about prayer in a short video produced by the Society of Jesus. He says: When things are getting rough or busy, or I feel a lot of interior movement—positive or negative, but especially negative—I feel like one of the antidotes is to sit down and lay it out before God and say, “God, here it is, here’s my heart.” For more on prayer, explore the archives here at dotMagis. Spiritual directors William A. Barry, SJ, and Bernadette Miles discuss Ignatian spirituality, understandings of Jesus, and spiritual direction in this nine-minute video from Spiritual Directors International. Barry is the author of multiple books on Ignatian spirituality, including A Friendship Like No Other and Changed Heart, Changed World. Becky Eldredge, dotMagis blogger and author of Busy Lives & Restless Souls, walks us through the steps of the Examen in this four-minute video. As Eldredge explains it, the steps are: Ask for the Holy Spirit’s help. Be thankful. Notice God’s presence. Notice the lack of God’s presence. Look to the future. For a peek into why Eldredge loves praying the Examen, watch her conversation with Paul Brian Campbell, SJ, here.